The SmartLINK system by Agri-Fab is a unique lawn care system that makes lawn care easy and saves space in your garage. This SmartLINK Plug Aerator allows air, water and nutrients to reach the soil, and it easily connects to the Master Platform in seconds (without tools). The John Deere PCT-17JD tow-behind poly cart is unmatched for hauling mulch, dirt, firewood, landscaping supplies or virtually anything around your yard or farm. The steep 450 dump angle and convenient foot pedal release make unloading quick and ergonomic. Large pneumatic turf tread tires provide excellent shock absorption and prevent lawn damage. Its thick polypropylene bed is compression-moulded for superior strength and unsurpassed durability. Featuring a true 1,000 lb. hauling capacity, the PCT-17JD will withstand even the heaviest of loads. Don't be fooled by exaggerated hauling capacities. John Deere poly carts and brought to you by the brand you've trusted for over 175-years. 15 cu. ft. Poly Swivel ATV Cart, 1250 lb. capacity is rated 4.7 out of 5 by 13. Rated 5 out of 5 by JR from Best accessory I have ever bought for my quad. So easy now to haul the tools and equipment neede... Best accessory I have ever bought for my quad. So easy now to haul the tools and equipment needed back in the woods or out in the fields. Built like a tank and should last for a long time. Swivel dump is an added bonus. When home I use the garden tractor to haul mulch. Rated 5 out of 5 by EABill from This trailer meets our farm needs quite well. We use it for many uses around here. The large tire... This trailer meets our farm needs quite well. We use it for many uses around here. The large tires help when on wet ground and sinking problems with heavy loads. The hitch works quite well and trailer is easy to move full or empty. Rated 5 out of 5 by JeffA from Very well built, assembly was easy, love it.... Very well built, assembly was easy, love it. Rated 4 out of 5 by Gene from Easy to assemble. Only problem were the grease fittings for... Easy to assemble. Only problem were the grease fittings for the wheels, when tighten you cannot use them. To grease the wheel/axle assemble you need to loosen the fittings, move to a better position and grease. When done you need to tighten the grease fittings. Rated 5 out of 5 by Ropeclimber from Have not loaded it up, but pulls around the yard behind atv nicely. It is big than I thought it w... Have not loaded it up, but pulls around the yard behind atv nicely. It is big than I thought it would be. 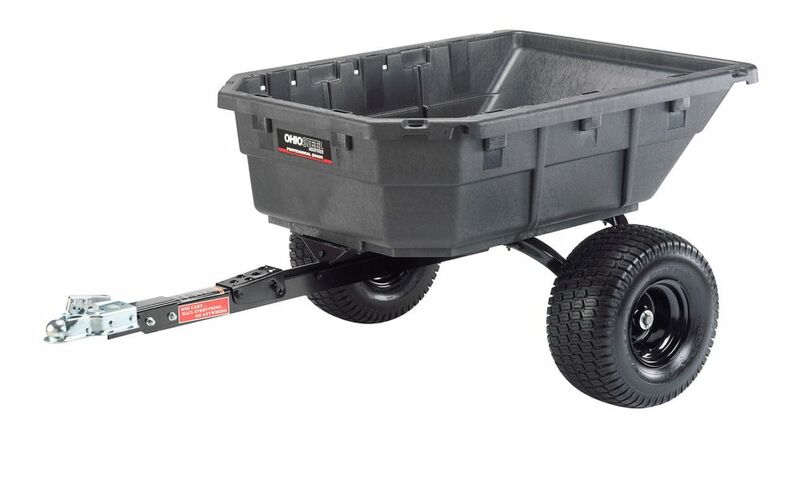 Rated 4 out of 5 by Mike mon oncle from Great cart for my ATV Bouth this cart few weeks back and i love it , great size plus i made a side rack in the pre-fit holes to had more stuff when i go fishing or hunting. The only things are the wheels bearing they should have been made more seallable like real bearings. Rated 5 out of 5 by Troy from Heavy Duty Bought this about a month ago, wanted a quality Cart that was tough. I was impressed with the components, all well made and strong, had it together in less than 30 min. The dump and swivel feature is very handy - with the cart in dump mode I can roll big rocks in and tip up - moved a couple 100 lb rocks this way no problem I have not put it through any real hard work yet but so far very impressed, feels like you have spent your money well !